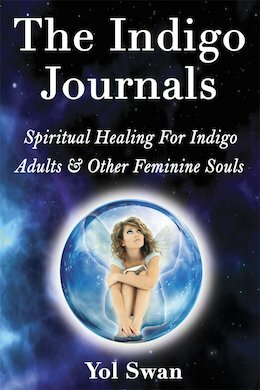 Do You Like Spiritual Poetry? I am super excited to share my new poetry book with you! I’ve been writing poetry on and off for years and have watched it go from highly existential to non-dualistic, oftentimes with a bit of an edge. 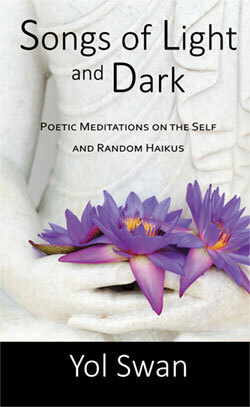 Songs of Light and Dark: Poetic Meditations on the Self and Random Haikus is an intimate exploration of the contradictory journey of the soul in search of itself. How can we transcend the mundane if our longing for truth is veiled time and again by shadows of sadness and regret? And yet, behind a spiritual seeker’s yearning for the Self lies the inexorable clarity that there is nothing but the Self orchestrating our existence. 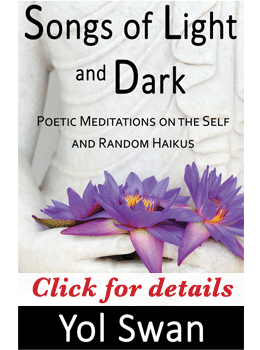 In the same manner that our eyes need to adjust when going from the light into darkness and from darkness into the light, these poems reflect the unfolding transparency of spiritual experience. in search of your own eternity. I have looked. I have sought. truth of your divine play eluded me. of my own harrowing game. for I am nothing but your experience. Click here to learn more about the book and where to purchase. Please spread the word and if you buy and enjoy it, I’d greatly appreciate a review where you get it. Thank you for your support!!! © 2015 Yol Swan. All rights reserved. ← What Are Your Goals In Life?